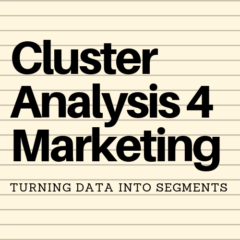 How does cluster analysis help in marketing? Do I need to use cluster analysis? What sort of data can I use? What is a segment profile? How does the calculation work? What software can I use? Why does cluster analysis sometimes give different results? Segmenting customer brand preference: demographic or psychographic? All material copyright (2016-19) and for educational purposes only. This website and the free Excel template has been developed by Geoff Fripp to assist university-level marketing students and practitioners to better understand the concept of cluster analysis and to help turn customer data into valuable market segments. Geoff is an experienced marketing lecturer, practitioner, author and entrepreneur. He has been an adjunct lecturer at the University of Sydney since 2002, teaching in a variety of undergraduate and postgraduate subjects.